Why should you use games and simulations to teach Lean material? What’s wrong with Power Point? Why waste time with a simulation, when you can take your team right out to the shop floor? Learning through games has many benefits. I’m no Taichi Ohno, but if he can coin the Seven Wastes, I can come up with my own list of seven. 1. 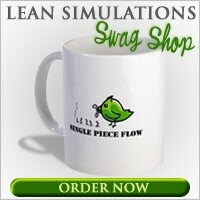 Simulations demonstrate Lean principles in action. Once participants have seen with their own eyes the difference between Push and Pull production, they'll never forget it. That massive stack of half assembled Lego is a sight that will burn itself into their brains. 2. Games involve your audience! Maintaining your audience’s interest is one of the hardest things to do during training sessions. Especially when they don't want to be there! Some people treat it as a paid vacation day, while others can’t stop working, thumbing their Blackberry’s below the table as if you can’t tell what they're doing. Keep those Power Point slides short and wake them up with a game! You will exercise their legs and their brains. And not too many people can fall asleep standing up! 3. Games are perfect team building activities. Mandate from the top: Everyone needs to know Lean! Games can be used to break the ice and get your audience to participate, but they're also great for getting people to work together. Apart from getting your class to be united against you (why do we have to do this silly game?! ), you can also create bonds by pitting them against each other! Design your workshop with multiple sessions and divide your group into teams that compete against each other. Once the teams see the posted simulation results, they immediately become more competitive and try to improve, by working together! 4. Simulations are small and flexible. Manufacturing and business processes are large and complex. Providing real-world improvement solutions within the current business is difficult within a two-day training session. If it was that easy, you would have done it! They can be tailored for different audiences. For a short demonstration in a kaizen event, use The Penny Game. For a multiple day training session, consider The Beer Game, which can be as complex as you want. 5. Games are confidence builders. Your audience consists of many types of people. Shy, introverted thinkers mix it up with overbearing loudmouths. By placing people in roles they are not familiar with, you can empower them. A shop floor employee can shine while directing the divisional manager, who’s struggling with the bottleneck process. When roles are switched in such a way, managers can see what it’s like to be in the trenches, while others can become confident with their new responsibilities, even if their factory is just making paper airplanes. This is also a good opportunity to identify problem solvers and leaders. These are the people you want in your next kaizen event. Just be watchful. Not everyone enjoys being pulled out of their comfort zone. A good facilitator must recognize this and balance appropriately. 6. Test real processes with simulations first. Sometimes simulations are used for exactly that. To simulate actual processes in your business. Kanban sizing is a good example. Kanban card calculations can become pretty confusing once all the factors such as lead times and signal stagnation are considered. Simulating this with pieces of paper or on a spread sheet will make things a lot clearer and highlight potential issues before implementing into the real world. Another example of this would be designing new work cell layouts with papers representing work equipment. Let’s say you’re just learning the ropes of facilitation. You’re still a little uncomfortable standing up in front of people. Here’s a little secret. . .
A well-run Lean game will make up for mediocre presentation skills! That’s right. I said it. Your presentation doesn’t matter. People will only remember the game. A simulation allows you to break away from teacher-mode and interact with individuals one on one. You can relax, joke around, answer questions and have a breather while the teams are interacting with each other. It’s for you just as much as for them! What do you think? Have you participated in a Lean game? Did it help you retain the information taught? I want to site this page so I would like to know who is the author of this page. Hi Manish! I'm the author of this page. You can learn more about me and this site on the About this site page. I wanted to site your work in my paper that is why i was asking. Zhou vitamins is extraordinary for its extensive range of merchandise Neurohacks, which includes antioxidants, beauty, coronary heart health, sports nutrients, and weight management products in addition to its line of nootropic supplements. A lot of those different products have strong reputations with high quality reviews. I hope to know more about the benefits.